OUR FULL 18 GAUGE WATER TUBES WILL NOT SPLIT LIKE LIGHTER WEIGHT BAGS! 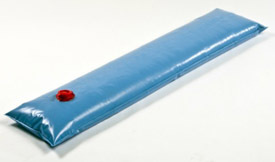 Super heavy duty virgin vinyl water bags will last and last and last. Much thicker than most discount pool store type tubes. These water tubes are available in single or double chamber styles, and we even have special corner tubes (pictured above). We have 8' and 10' length tubes and money saving Discount Packs if you buy in quantity (see below). Up to 33% heavier than other bags. Quality no-leak valves are easily filled with a garden hose. How Many 8' Water Tubes do I need ? DUE TO OUR SHIPPING REGULATIONS, WE CANNOT SHIP POOL COVERS OR POOL WINTERIZATION ITEMS INTERNATIONALLY .